As a part of our commercial expansion, we are pleased to welcome Mirja Andersson to our team at Lindhe Xtend. Mirja is an occupational therapist and most recently comes from Somna AB. We are pleased to strengthen our team with Mirja, who will spend most of time to take care of our Nordic customers in her role as Sales Manager Nordics. Welcome to the team! It is a great pleasure to announce that Masson Healthcare will be our new distributor in New Zeeland and Singapore. We welcome Masson Healthcare and their dedicated team as our distributor, and we are convinced that their clinical expertise and good contacts and channels in the selected markets, will fit well with the innovative products of Lindhe Xtend. Read more about Masson Healthcare här. Meet Lindhe Xtend at the annual SOIT and OTB meeting in Stockholm. för Livet in Halmstad where we will be present. We will exhibit our new version of the Xtend Foot that features a titanium pyramid that gives lower building height and reduced weight. It is also water-proof against salt- and pool-water. Read more about SOIF/OTB here. Looking forward to meeting you there! Meet Lindhe Xtend at NITO where we will exhibit our new version of the Xtend Foot. It features a titanium pyramid that gives lower building height, reduced weight. It is also water-proof against salt- and pool-water. Read more about NITO Norway here. Looking forward to meeting you there! Meet Lindhe Xtend at ISPO France where we will exhibit together with OKO Solution. We will exhibit our new version of the Xtend Foot that features a titanium pyramid giving lower building height and reduced weight. It is also water-proof against salt- and pool-water. Read more about ISPO France here. Looking forward to meeting you there! We are indeed very happy to announce that OKO Solution is our exclusive distributor for France and its overseas territories. The Xtend Foot will receive its LPPR-listing code within one and an half month and the product will be jointly demonstrated on OKO Solution’s stand at ISPO France, taking place in Lyon on November 8-9, 2017. Read more about OKO Solution here. Every year, Halmstad Näringsliv AB in cooperation with the University of Halmstad, hosts the Golden Awards Ceremony in Tylösand, outside Halmstad. The purpose of the Innovation Award is to support and motivate innovation-based companies to grow and become competitive on a global market. The company has made a fantastic voyage so far and built a dynamic team, both in and outside the company and is constantly developing new innovations is close cooperation with the University of Halmstad. The combination of new innovative solutions and the highly competent team, is judged to be able to build an international growth company within Life Science, with products that gives amputees a chance to get a higher quality of life. It is very rewarding and exciting to get the Innovation Award and shows that hard work, a true user-innovation and a solid thinking in establishing a great team, pays of and is being appreciated. Now we are looking forward to taking Xtend Foot to the international market! Tommy Hedberg has a long experience from international business and has held positions as MD at Atos Medical, VP of Marketing & Sales at both Atos and Medscand, and as Product Manager at Leo Pharma. With his international expertise, solid experience and board experience, Tommy will be a great asset for the company. Peter Gerhardsson has over 30 years of experience from the pharmaceutical and med tech industry. His focus on sales and marketing, primarily within the segment of diabetes, contributes a valuable and broad international network. Peter holds the position as VP at Dexcom and has previously been responsible for business development at Novo Nordisk and Medtronic. Henrik Malchau is a Professor at Harvard Medical School at Massachusetts General Hospital and Chief Physician at the Orthopedic Department at Sahlgrenska University Hospital in Göteborg. With his long experience both of clinical work and research, Henrik will contribute with a strong international network and clinical expertise within the orthopedic field. Anders Rosengren has 20 years of experience in business development of medical devices in both start-ups and mid-sized companies. Anders contributes with a solid technical expertise, broad network as well as commercial and international experience. Christoffer Lindhe plays an important role in the board as the Founder and Majority owner. With his contacts, innovations and inspirational approach, he constributes both practially and strategically to the development of the Company. The expansion for Lindhe Xtend continues and we are pleased to introduce our newest team members – Malin Östlund and Jiri Kubicka. Malin will be responsible for the company’s supply chain to assure high precision and quality of delivery to our customers. Malin has many years of experience of medical devices and project management and was previously working at the Getinge Group. Jiri Kubicka has a long experience from Med Tech companies like BD (Becton, Dickinson and Company) and Nolato Medical and has held positions as Director of Product Development and Project Management. With his technical background, Jiris contributions range from production planning and strategy to broad material knowledge, testing programs and supplier evaluations. Lindhe Xtend will exhibit at the Nordic Orthotic & Prosthetic Conference in Reykjavik. We will be demonstrating both the Xtend Foot for outdoor usage on uneven grounds as well as the cosmetic cover Xtend Cover. If you are going, please make sure to visit us at our stand. Most welcome! Lindhe Xtend will attend ISPO World Congress in Lyon on June 22-25, 2015. If you would like to meet us, please already now book a meeting by sending an e-mail to: info@lindhextend.com. 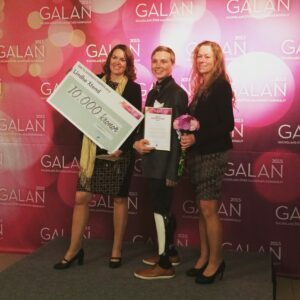 A unanimous jury declared Lindhe Xtend from Halmstad winner in ALMI Pitch Event, which took place during the Åre Capital Market Days. A total of 20 companies took part in the competition and the final was won by Lindhe Xtend, which is owned and run by Christoffer Lindhe. ”Fantastic and unexpected to win this award. It has been an instructive day with a lot of presentations and feedback from a panel of expert investors,” says Christoffer Lindhe. Tobias Riuttamäki – Country manager and partner at Frontier. Under the motto that everybody is entitled to live a free and independent life regardless of physical conditions and age, the Jimmy Dahlsten Fund wants to help entrepreneurs and visionaries to realise ideas which create new opportunities for people with reduced mobility. The aim is to support projects which, if they are realised, can help many people to achieve a better quality of life. 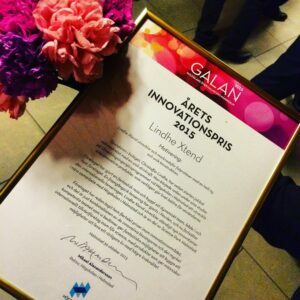 Lindhe Xtend and the Xtend Foot product has been awarded a grant in the Innovation category. ”All too many good ideas don’t get past the idea stage, and it is a great pity as there are lots of good innovations. We therefore want to use the Jimmy Dahlsten Fund to enable more projects to be developed into finished products and services which provide benefit for the users,” says Thomas Fogdö. Together with founder Christoffer Lindhe and Marketing and Sales Director Jessika Broström, the ownership of Lindhe Xtend AB is now being strengthened with Almi Invest in Halmstad, Halmstad University’s Investment fund and Lindhe Intressenter AB. ”This ownership structure gives us access to both capital and a depth of knowledge within medical technology. This allows us to enter the market at a faster pace and also enables us to broaden our range in the long-term. This is important in terms of our future competitiveness in procurements,” says Christoffer Lindhe, CEO and founder of Lindhe Xtend. Come and meet Lindhe Xtend at Ortopedteknik in Gothenburg. On stand 15 we will be exhibiting our range of prosthetic feet and giving practical demonstrations on our walkway of the flexibility in Xtend Foot High Active. You will also have the chance to see the secret behind the design and get to meet Christoffer Lindhe and others who use the innovative new prosthetic foot. A life lived to the full! Inspiration – user-led innovation – human foot prostheses. Lindhe Xtend is participating in Momentum weekend in Trondheim on 28-30 November. We are exhibiting Xtend Foot and Xtend Cover and the opportunity will also be available to try out Xtend Foot. Christoffer Lindhe is also holding an inspiration lecture on Saturday at 3 p.m. Read more at www.momentum.nu. Because a product has been produced which doesn’t just promote the use of composites, but also produces an enormous amount of benefit for the user. With its Xtend Foot, Lindhe Xtend has developed a prosthetic foot which is more mobile and stable and where, furthermore, the foot blade can be adapted to the underlying surface. This makes it a really innovative product, which will be of great benefit to many people, and which can make everyday life easier for its users. Some seventy or so people from both the industry and nominated companies had gathered to hear which contributions would receive this year’s awards. ”The fact that plastic is a varied material that can be used and developed in many different ways becomes very clear when we work with Plastovationer. This year too we have seen a broad spectrum of products, for both industry and consumers. This is evidence of innovation that bodes well for the industry,” says Martin Dyberg, chief editor of Plastforum. “Through his persistance and willingness to inspire other, he has challenged himself and the people around him. He is the prime example of how we all can see opportunities when the times are really rough. He is a role-model and a true fighter, a hero in the daily life”.